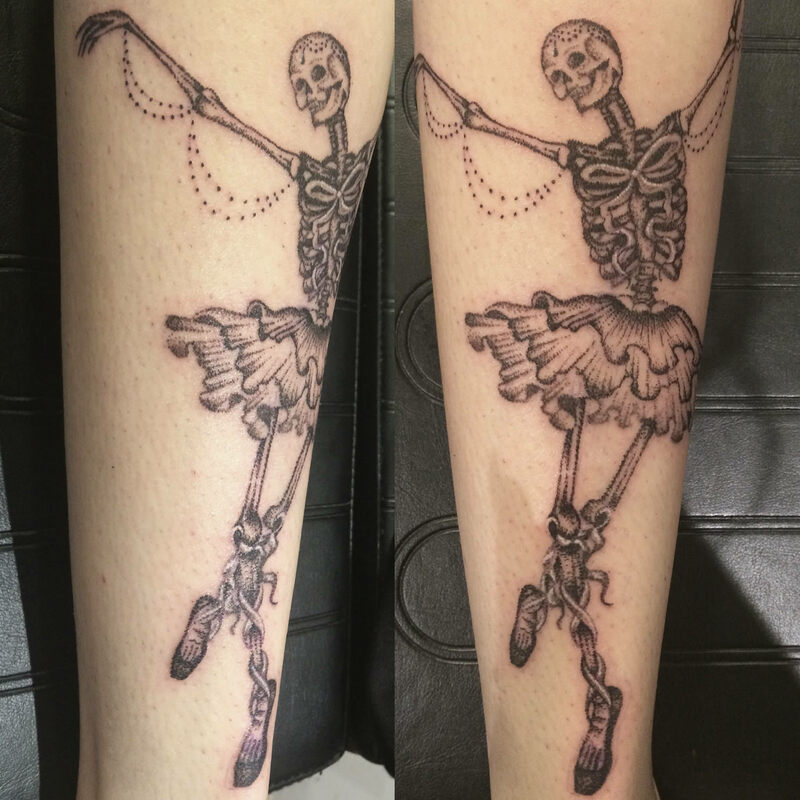 At twenty-two Sophie Brown, from Warrington, Cheshire, a town in England situated between famous cities Liverpool and Manchester, is a promising artist on the UK tattoo art scene. 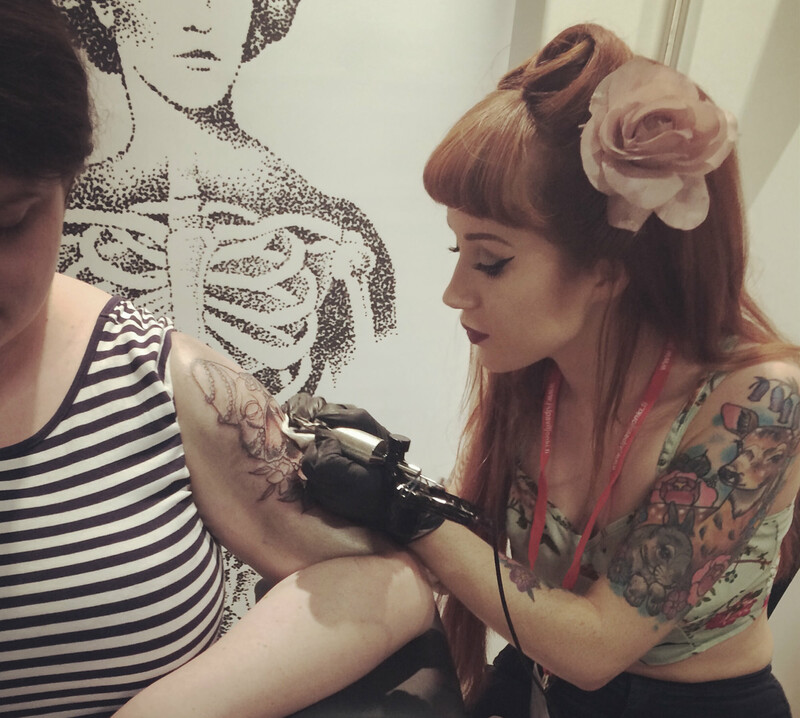 In a short space of time, she has won several prizes and had work featured in Total Tattoo magazine. Sophie is also my cousin. Despite our shared family tree, she was pretty much a complete stranger to me. However, on a recent visit to my hometown, I arranged to meet up with Sophie at a coffee shop. Over a black coffee (me) and orange juice (Sophie), we had a conversation about her work to date and ambitions for the future. I found my cousin to be a funny and humble, but also quite clearly a hugely talented individual. 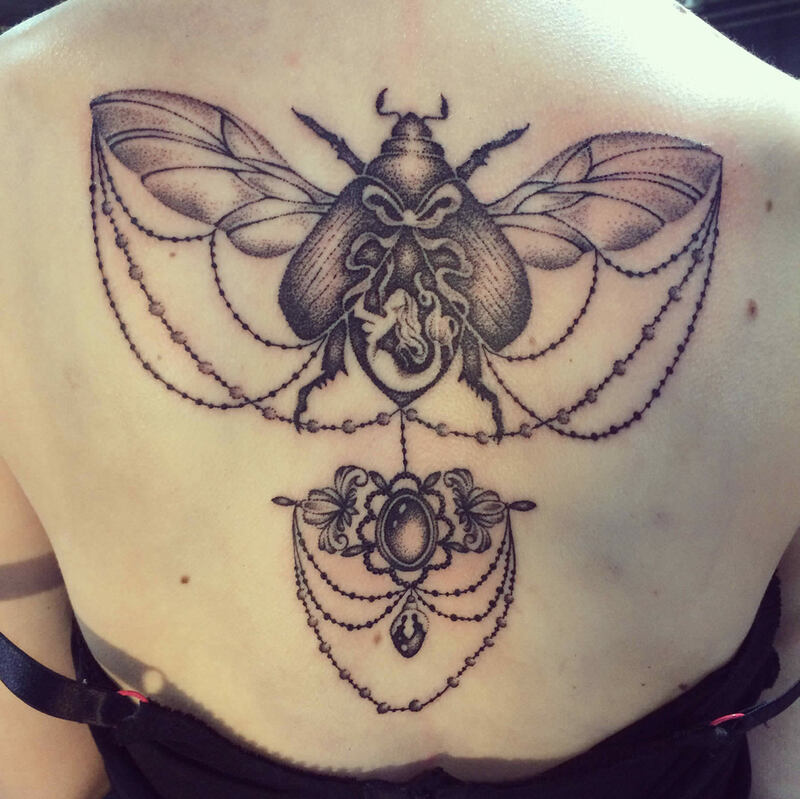 Flying beetle with jewelry attachment: a Victorian-style tattoo by Sophie Brown. Your skills got you noticed early on. 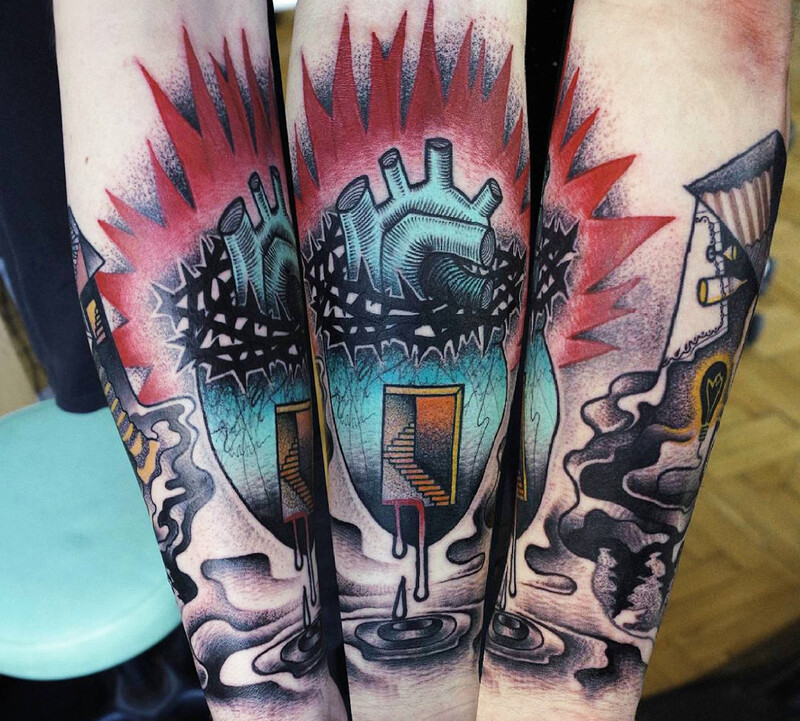 How did you end up working at the Forever Ink studio? I was at another studio doing my apprenticeship, and I knew who Danny [Edwards] was, because he has a really good reputation. He left another studio and started up his own. They were really busy and they needed somebody. Danny put a job advert out, but they said they wanted somebody with five years’ experience, and I’d only been doing it for four months. I applied and he ended up offering me the job. 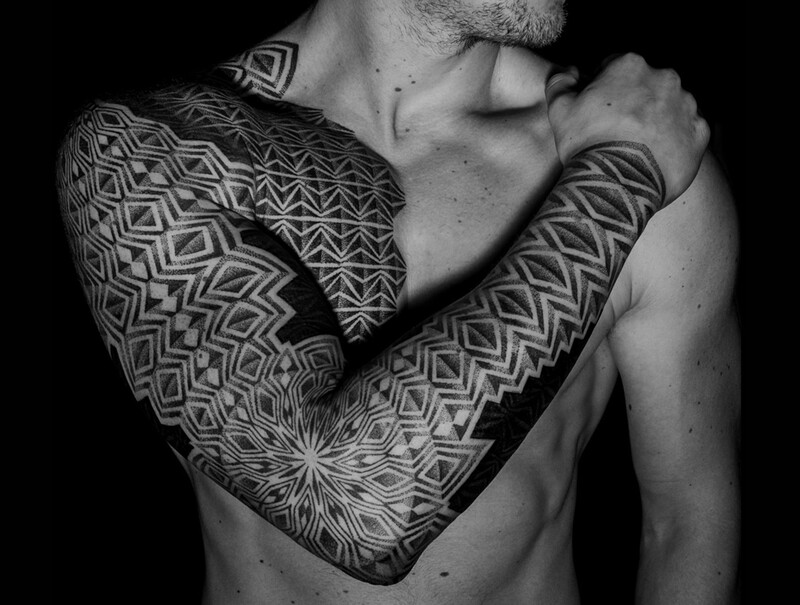 What are you influences, as a tattoo artist? 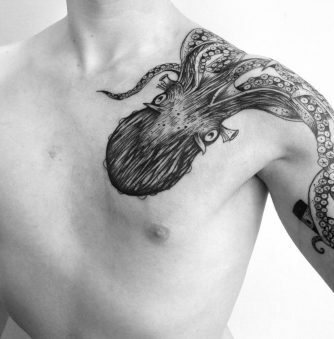 Before I started tattooing, I studied painting. I get a lot of inspiration from paintings. I love vintage botanical illustrations, too. I look at those a lot. There are books and loads of reference sources online. I have a big encyclopaedia of flowers. I look at different artists all the time, because if I look at the same pieces, I’d be influenced too much by one thing. 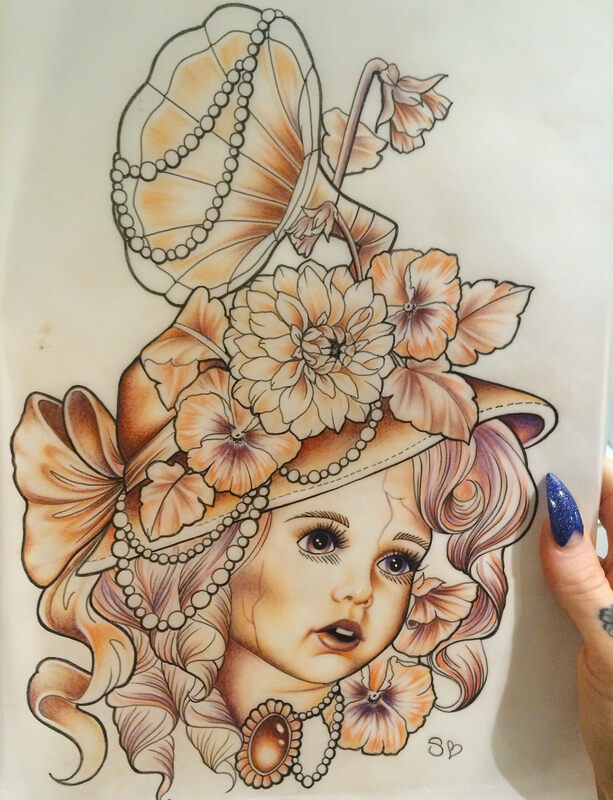 Tattoo flash of a doll with cracked porcelain face. 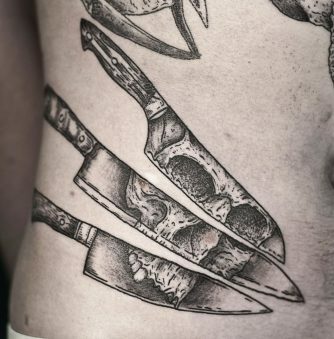 You’ve already picked up a couple of prizes at tattooing conventions. When did you first start attending these? You’ve won two prizes in nine months? Yes [laughs]. I didn’t expect it. 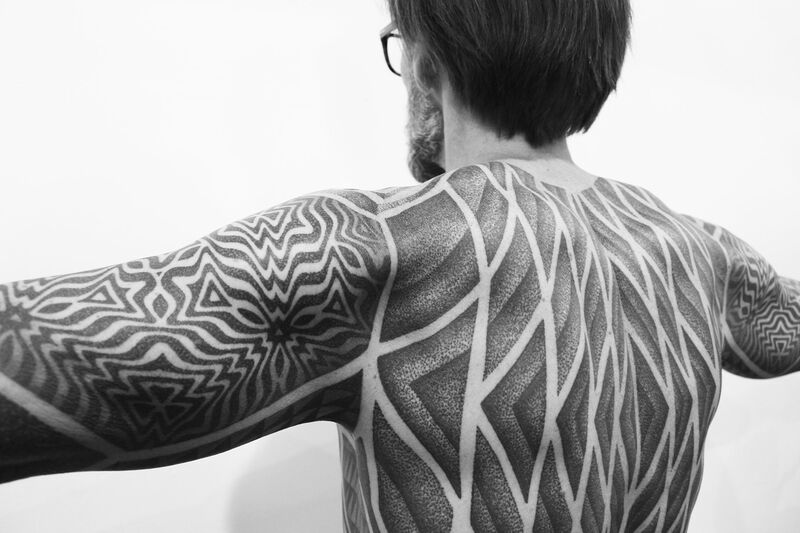 The first one was in Finland (Best Small Colour, JKL Tattoo Convention) and the second one was in Blackpool (Second Place in Best Female Composition, Tatcon Blackpool). That must give you a lot of confidence. Yeah, I think it did. And it made me feel part of the industry and people recognized me in the industry. 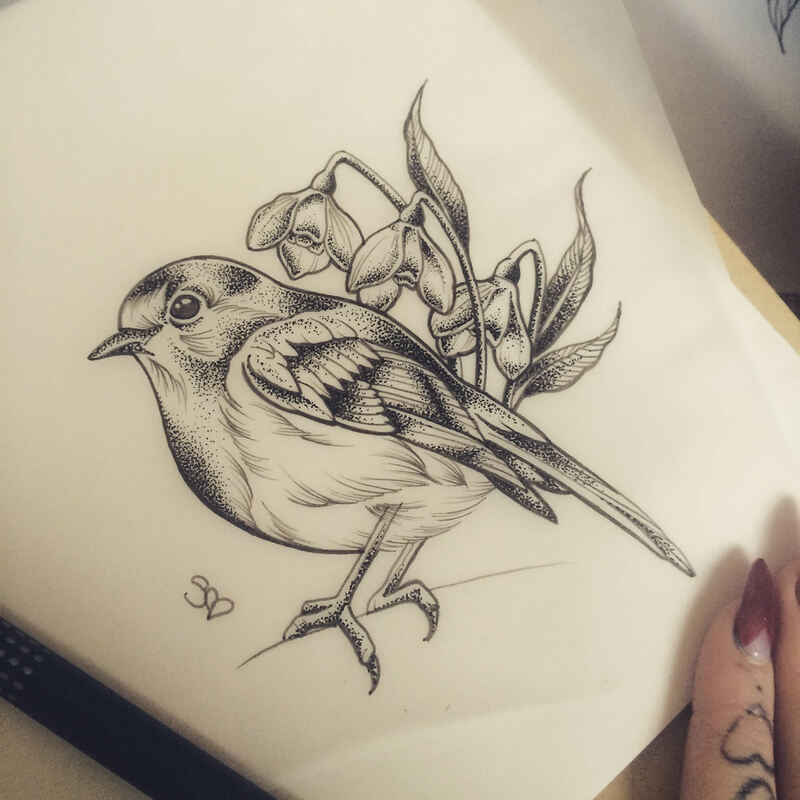 Sophie’s love and skills in drawing led her to a career in tattoo art. I’d really love to travel. 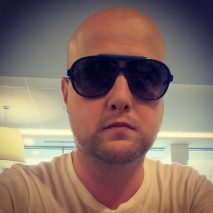 There’s a guy who works with me, who just did a year in Australia, working in different studios. I’d love to do that. I don’t have much of a plan, though. You don’t want your own studio setup one day? I’m not very organized and I’m not that interested in the business side of things. 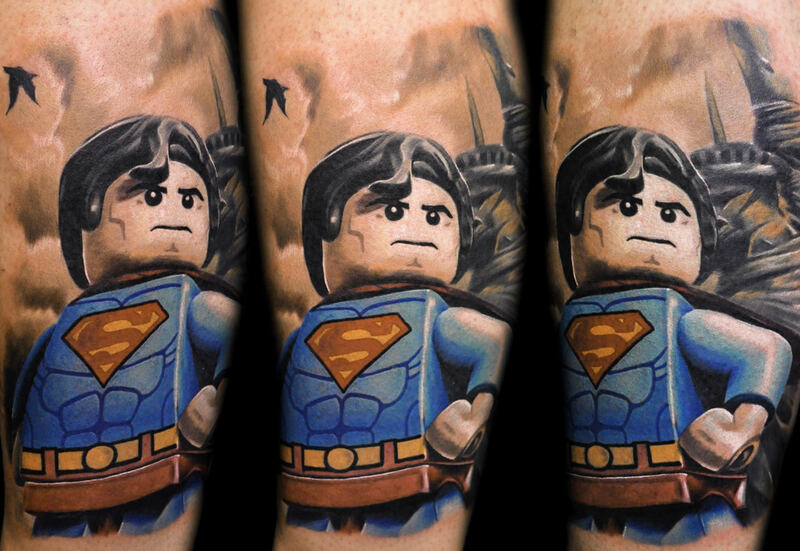 I’m doing a guest spot at a studio in October, in Solihull, the Square Tattoo Studio. I’m going to go and work in that studio for a couple of days. I’ll be able to pick and choose what I want to do, and more the kind of thing I really like doing. 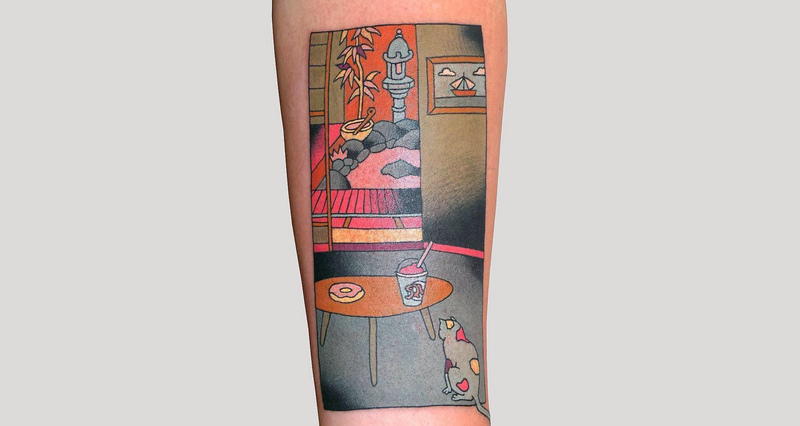 I like doing all the tattoos, but I have to do a bit of everything. 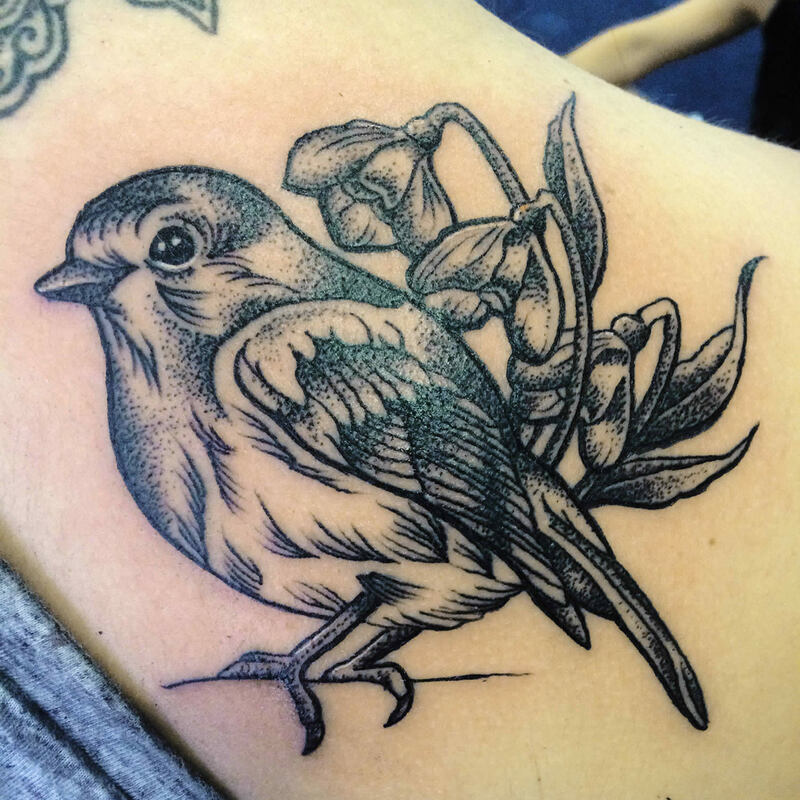 Robin tattoo: Sophie is inspired by the natural world. I use an Ego machine for shading and colour, but prefer traditional coil machines for lining and dot work. I really like Magic Moon needles and Revolution needles. How important is social media in promoting your work and getting commissions from people? You’ve got thousands following you on Instagram and Facebook, I see. Massively. I think I get about seventy percent of the work through Facebook, so social media is really important. They just contact you out of the blue? Yes. They see stuff online and message me, then we book a consultation and they come in. A lot of the work is done that way. 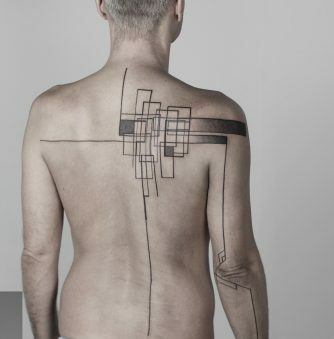 What’s the most complicated tattoo that you’ve done, up to now? I don’t know because I do that so many different styles. Portraits of people are more complicated and there’s a lot more pressure because it has to look like that person. 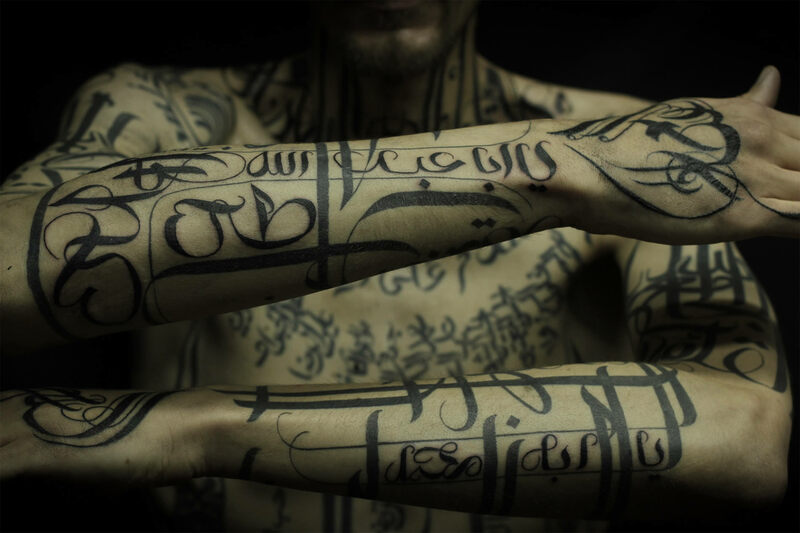 I know that you’ve tattooed family members, including my brother and a cousin of ours. Do you get nervous? A bit, yeah. It doesn’t matter so much, because our family is huge, when it’s cousins who I don’t see that often, but when it’s my dad, who I see every day, it’s nerve-racking. If my Dad doesn’t like something, he’ll tell me. Do you freehand a lot? Yes. I use stencils sometimes, but it’s easier to freehand. If it’s something really big, like a phoenix, or something that’s going to be really huge, then it’s got to flow with the shape of the body, so I don’t see the point in using stencils. 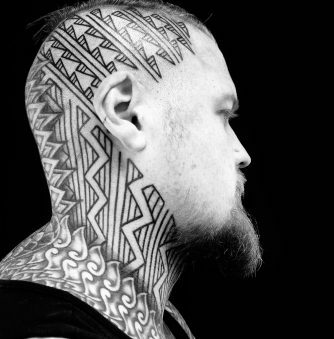 What’s the UK tattooing culture and scene like? I really like the industry and everybody is really friendly. I think because everybody does different styles… it’s not like when you’re say, a plumber, and you’re all doing exactly the same thing and there is competition. Everybody is doing different things. When you’re at conventions, there are so many people doing different things. Follow the artist on Instagram or Facebook.